Is it worth it? Definitely! Who doesn’t want a TV for your sims to watch in the garden?! Do I need to buy a telescope to observe the strange lights? It says I need an adult to splish splash in the bath, why? Where do I buy the teddy bear from? 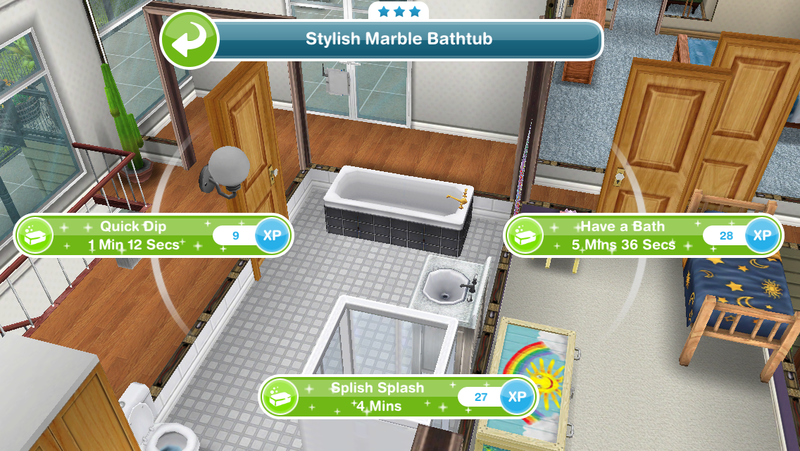 EXCITING NEWS: The Sims Mobile! Ooh, thanks. I’ve just started this. I really want that outdoor cinema. Ahhh, what if you don’t have any Toddlers ( or preteens or teens, for that matter )? Does that mean that the poor little one who is running around in your park, will be stuck there forever? Not to worry, we’ll bring him some food… from time to time. Poor little guy! This quest will be available for you to do whenever you like so if you don’t have a toddler yet don’t worry, she will still be in the park when you are ready to complete this. The easiest way is to age up a baby..adopting a toddler is more costly. This quest seems so familiar. Have we done one similar in the past? Thank you so much! You’re the greatest and I appreciate all of the hard work that you do on all of these quests. 😊 Happy simming. Wow wow wow! I love your blog! Slightly off topic question: how on earth do you have so many LPs, SPs, and Simoleons at level 29 (it seems so in the YouTube video)? Did you buy them all? I’m at level 45, and can only make S 100,000 a day if I work super duper hard (plus around 40k from sending my Sims to work)! I’ve followed all your tips (I mainly cook [and can get about 100 LPs if I work hard using the cheese and tomato option], send sims to work, plant, collect daily reward [which is only S 7400], and occasionally bake, etc.). Am I doing something wrong? I feel like it takes me ages to get any substantial income. I have never had a million simoleons at hand. Any other tips? Look in the park for the super villain, this will not appear in your active tasks tab. I’m at the part of the quest where I have to ride decline the villian toddler’s offer it told me to go to the park so I did and I can’t find her. She isn’t there. What do I do? I started the Teen Idol quest where i can unlock more teen furniture. Did this pause the current quest? Please help I want the outdoor cinema! The teen life event hasn’t paused this one, this was a glitch but I was told this morning that the issue has been fixed now so Mini Masterforce should be back in the park, if you still cannot find her after restarting your device then contact them for more help. I’m at the stage where my toddler is back at the park to decline the villainous scheme, but there’s no super villain to be found. Do you know where I’m meant to look? I was told this morning that the issue has been fixed now so Mini Masterforce should be back in the park, if you still cannot find her after restarting your device then contact them for more help. How do I *Decline villainous scheme*? The toddler with the purple outfit isn’t in the park.. I am at the “decline scheme” part,but I cannot find the super villain toddler,not in the park ,neither on anywhere.What do you recommend? The super villain has disapperead I can’t find her. After I plotted my escape I went to the park she is not there. What to do? hi! I need your help.. I can’t seem to find mini masterforce in declining his scheme in the park. I wen around a hundred times and Instill can’t find him.. thanks in advance! I can’t find the villain to decline the villainous scheme. They aren’t in the park or in any of my houses. I’ve force closed my game already. Any tips? I seem to have lost Mini Masterforce. I reached 95% completion, and before i can “hug her goodbye” i have to locate her. She doesn’t show up in my simtracker, and i have visited every conceivable location (with my toddler and adult) and cannot find her. is there a way of summoning her to my location? has anyone else encountered this before with another visiting NPC sim? I was told this morning that the issue has been fixed now so Mini Masterforce should now appear, if you still cannot find her after restarting your device then contact them for more help. Trying to find Mini Masterforce to say good bye—help! Where is she? Is she not appearing at the house you are currently at? Had the same problem, couldnt find her anywhere. I contacted EA and they corrected it for me (quickly in fact). I have the little todder going around the park all day but when I click on him, the bubble that opens is in blank, the only think I can do is accept and close the bubble, so I cannot start the quest! I am trying to get an adult to hug a toddler (11 hrs, 45 min). When I visit the house, the time resets back to zero. Have you tried restarting your device before visiting the house again? If it still isn’t working you may want to contact EA to see if they can fix this issue for you. Im trying to finish the quest but i cant the villain. Im trying to find her to hug her to end the quest. Where can i find her? Pls help . Thank you. I was told that the issue has been fixed now so Mini Masterforce should now appear, if you still cannot find her after restarting your device then contact them for more help. So, first; Amazing blog. We have read a lot and especially for game help; So glad we found You. Refer you every chance we get. You articulate wonderfully. Feel as if we’re being spoken to so it flows so much easier than most and makes compression great! So no worries please! One thing; ATT READERS: Before posting comments just please would you take a minute to scan for similar questions as not to take more from us and valuable time from our host especially. Thank You! Now for our question. On the toddler villain quest, the tea set and dollhouse times you posted; are they for one or three star rated items? And what are the time differences for them please? Seems most are three stars as we go through but wanna make sure and figure if it’s worth buying up? Thank you again for all you do to make so manies gaming experience so much better. Hope your getting paid, more the just perks. Worth so much and if ever need a petition sure we can get millions to back you. Write for EA direct maybe? Well, best to you & zillion thanks again! Unfortunately I forgot to find out the times for all the star ratings for this quest so the teaset I used was only a 2 star and that took 9 hours 30 minutes and I didn’t get the other ones but I got the two and three star dollhouse ones, the 3 star took 12 hours 30 minutes and 2 star should be 14 hours, sorry about that! You’re very welcome, thanks again and sorry I couldn’t be more help! For the penthouses, how much do the templates cost? The cost varies depending on how many other houses you have in your simtown already. You can do the “Have a toddler pretend to sleep- 9 hours 30 minutes (bed)” on adults bed, so can be 8hour 30 minutes. Just for your help! You help me a lot. You are amazing.. .
I’m doing the Pretend To Sleep one right now and it’s taking forever! I have no LPS (I spent them on the restaurant) and I only have 1 toddler sim so Daycare (I made my own Simtown Daycare with a toddler and a baby inside but the baby is doing a hobby at it’s home) is closed! 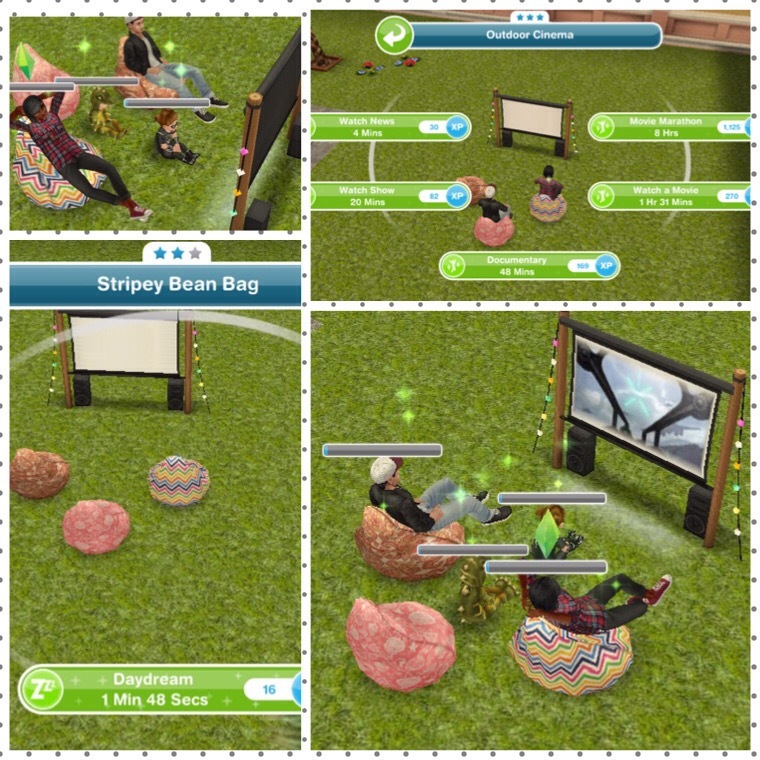 Hi, I wasn’t able to finish this on time 😦 I can’t find the outdoor cinema in the outdoor decorations section, do you what else I can do to get it? If you didn’t complete in the time limit then you will be unable to get the outdoor cinema as you can only get it if you complete the quest in the time limit. What’s the total amount of days this will take? I have to demand peace cookies, but when I select an adult with my toddler, the option doesn’t show. What should I do? Have you tried using a different adult? In the strange things in simtown quest if my time limit finished and i didn’t finish all the quests yet does that mean i cannot finish the rest of the quest or i won’t get the costumes only? I’m kinda comfused because many things in the town to be built wants me to finish that quest and if i didn’t finish it you said i cannot start the quest again so that means am not going to open them because i didn’t finish the quest?